Easier to maintain (5-15 minutes a week of watering and weeding during the summer). Is cheaper in the long run (less water, less maintenance cost). In future, water use and chemical use will likely be curtailed and lawn will be difficult to maintain. Better for the environment and your health to use less water, less chemical fertilizers and pesticides. You can have the beauty, colour, variety, and wonderful energy of flowering plants around you. If you really want lawn, Eco-yards™ can replace your lawn with a better option. We’ll put in grasses that are very hardy, stay green with little or no watering and grow slowly. A hardy lawn also prevents weeds. 40 – 70 % of municipally treated water is used on landscapes. Better use could be made of taxpayer dollars. Municipalities throughout North America are starting to restrict water use on yards. 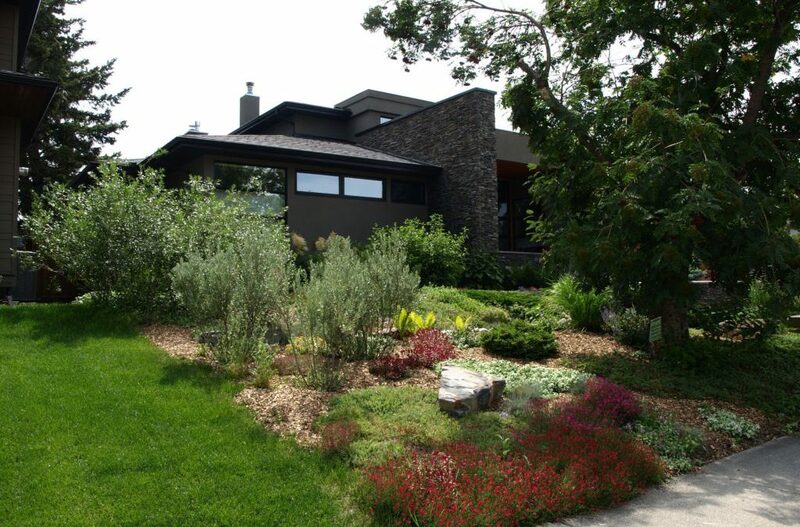 Our design and install services can help you to reduce water use in your yard. Lawn only absorbs 10 % of the water that a flower, tree, and shrub bed absorbs. So beds in urban yards help replenish underground water aquifers. Chemical pesticide (herbicide, fungicide, insecticide, rodenticide) use has been linked to many health problems. There include cancer, neurological disorders such as Parkinson’s disease, hormonal disorders (e.g. thyroid), birth defects, and developmental delays and impairment in children. Calgary is now the largest city in Canada without the protection of a pesticide phase-out bylaw. Calgary City Council in Summer 2008 directed the City administration to prepare a bylaw phasing out pesticides. It later withdrew the bylaw as it was so weak it would be ineffective. A pesticide bylaw is likely for Calgary’s future. Citizens need to take measures themselves to not use chemical pesticides and have yards that can be maintained organically. Chemical pesticide and fertilizer use and tilling the soil have greatly depleted the organic matter and micro-organisms in the soil. World-wide, urbanites and farmers are using organic methods to replenish the soil. Compost is their most effective soil enhancer! In Canada, 70 % of adults garden and 8 million households have yards. Canadians spend about 8 billion dollars annually on yard-related goods and services (Lorraine Johnson’s 2002 book Tending the Earth: A Gardener’s Manifesto).